A large trough centered over west-central Europe dominates our continent with a frontal system pushed across the north-central Mediterranean and N Balkan peninsula. A cold front expected to bring severe weather into some regions as airmass become marginally to moderately unstable across the large warm sector. Strong warm advection is expected across the SE Europe while cold weather remains across NNE Europe. An ENH risk has been issued for S Hungary, most of Croatia, Bosnia & Herzegovina, NW Serbia, extreme SSW Slovenia and ENE Adriatic sea with threat for severe storms capable of producing severe winds, large hail and torrential rainfall. A cold front pushes through the risk area during the day and evening hours from west to east where strongly sheared but moderately unstable environment supports severe weather across the warm sector. Strong southerly LL flow should yield good shear / helicity also in the lowest levels and some organized supercells seem possible. In addition, persisting SW flow should result in an excessive orographic precipitation along the complex terrain from NE Italy along the Dynaric mountain range towards SW Bosnia & Herzegovina, locally rain sums near 100mm in 24 hours is likely. A SLGT risk has been issued for NE Italy, parts of Slovenia, Hungary, N Serbia and Croatia with threat for isolated severe storms capable of producing heavy rainfall, marginally large hail and and severe winds. 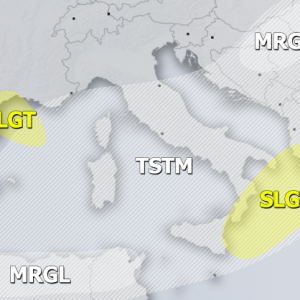 A SLGT risk has been issued across central Mediterranean including central and SW Italy towards Tyrrhenian sea and Sardinia with threat for severe storms capable of producing severe winds, large hail and heavy rainfall along the rapidly moving cold front. Moderate instability coupled with strong shear should support organized storms from the mid afternoon into evening hours when front pushes across the risk area. A MRGL risk has been placed surrounding the SLGT/ENH risk area from E Spain across central Mediterranean and Adriatic sea into north-central Balkan peninsula up to southern Poland and W Ukraine with marginal threat for some organized storms, capable of producing some marginal hail, heavy rainfall and strong winds. A SLGT risk has been issued for N Spain, SW France and SE Bay of Biscay with threat for severe winds, marginal hail (graupel showers) and heavy rainfall. A WNTR risk has been issued for the central Alps across N Italy, E Switzerland, W Austria and NW Slovenia where locally 50-80cm can be expected in 24 hours period over the mountains above 2000m ASL and threat for avalanches will be strongly enhanced.